Read our guide to a new National Institute for Health and Care Excellence (NICE) quality standard on identifiying and managing mental health problems in people who have a learning disability. Regular physical checks can help to diganose mental health problems in people with learning disabilities. Learning disabilities affect around 1.5 million people in the UK. The prevalence of mental health problems is considerably higher for those with learning disabilities than for the general population, with estimates suggesting between 30-50% of adults are affected. In January, NICE published new quality standards on the prevention, assessment and management of mental health problems in those with a learning disability. Recommendations include: annual health checks to encompass a mental health review; those with a serious mental illness being allocated a key worker; and psychological interventions tailored to the individual. Identifying mental health issues in those with a learning disability can be challenging for professionals and carers. Symptoms can be wrongly attributed to someone’s learning disabilities or a physical problem, rather than their mental health. It’s important to understand what is normal for the individual and whether anything is different. A change in someone’s behaviour patterns can be an indicator. This may include: expressing sadness, anger, fear or confusion; disturbed sleep; eating more or less; less concerned with personal hygiene; withdrawal from activities and relationships; reduced ability to focus or engage in activities and conversations; and frequent stomach pain or headaches. Some specific mental health conditions are more common in those with learning disabilities, compared to the general population, including schizophrenia – thought to be three times higher – and bipolar disorder. Anxiety disorders are common among people with autism: around 40% have symptoms at any one time, compared to 15% of the general population. Several factors contribute to a higher risk. These include poor self-image; difficulty expressing emotions; reduced social networks; being economically disadvantaged; genetic conditions, such as Down’s syndrome – linked with a much higher risk of dementia; and physical problems that are increased in people with learning disabilities. Ensuring that everyone with a learning disability has an annual review of their physical and mental health is everyone’s business, not just those who work in the field of learning disability. Most areas have a liaison nurse who can help those in GP practices keep up to date with their skills in working with this group of vulnerable patients. ‘The new emphasis on annual health checks also including a mental health review sounds quite obvious, but I think it’s timely and is going to be a changing point for people. 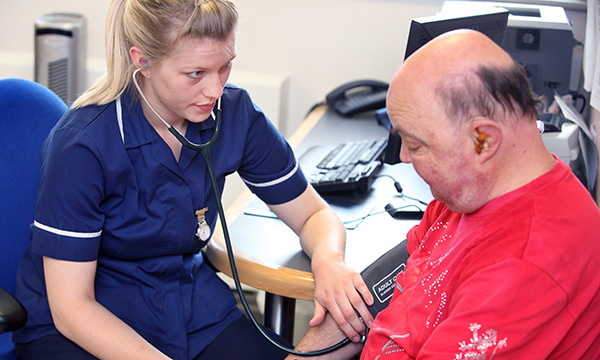 The standards also recognise the skills and experience of nurses working in mental health and learning disability, as they can be involved in carrying out this work.